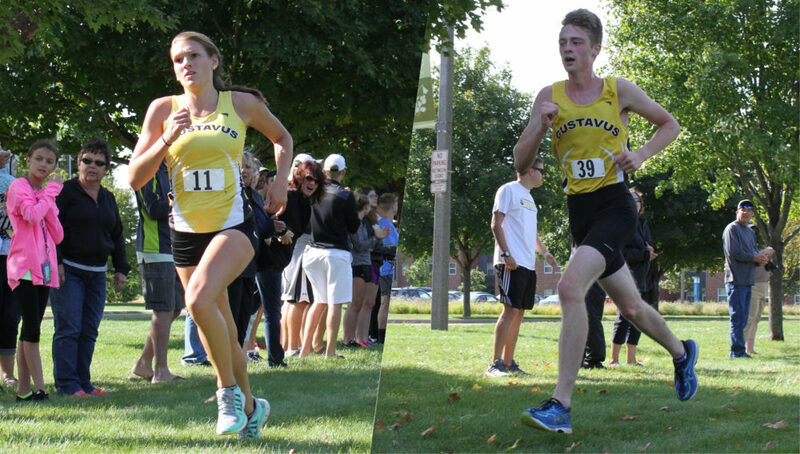 NORTHFIELD, Minn. – The Gustavus men’s and women’s cross country teams competed at Carleton’s Running of the Cows Saturday with the men taking seventh place out of 12 and the women finishing third out of 12. Carleton won the women’s race and Carthage won the men’s. The top-five Gustie women each posted a top-25 finish out of 116 runners. Sadie Klug (Sr., Waseca, Minn.) led the way, taking eighth place in 23:02.5. Olivia Rosenow (Sr., Maple Grove, Minn.) finished 20th in 23:39.4, while the pack of Sarah Anderson (So., Roseville, Minn.), Gabriela Passmore (So., Mapleton, Minn.), and Tierny Winter (So., Waterville, Minn.) took 23rd-25th, respectively, with times of 23:47.1, 23:49.2, and 23:49.3. On the men’s side, Andrew Stumbo (Fy., Boone, Iowa) posted the best race of his young collegiate career, taking sixth place out of 179 runners, clocking in a time of 26:16.8. Ryley Sandberg (Sr., Alleman, Iowa) crossed the line 32nd with a time of 27:05.4 and Brennan Gustafson (Fy., Kasson, Minn.) was close behind in 34th at 27:07.4. The pack of Nick Kerbeshian (Fy., Plymouth, Minn.), Alex Wischnack (Jr., Norwood, Minn.), and Ben Madigan (Jr., Kohler, Wis.) finished 42nd-44th, respectively, with times of 27:16.8, 27:17.3, and 27:19.2. The Gusties have next weekend off and then compete at the UW-La Crosse Jim Drews Invitational (men) and Tori Neubauer Invitational (women) on Oct. 14. The men’s race begins at 10:30 a.m. and the women at 11:30 a.m.